I’m not naming names or pointing fingers here at Madtini Labs today, but I’m pretty sure someone had replaced all of my jeans with exact duplicate pants that are 1-2 sizes smaller. While that investigation goes on and another turkey sandwich is consumed, we’re going to do something about the Wild Turkey leftovers. 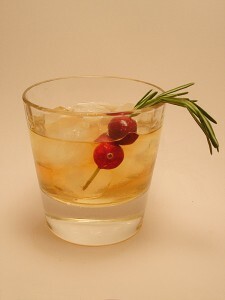 We’re going to keep it simple, bourbon on the rocks, but fancy it up a bit with a couple of fresh cranberries skewered onto a rosemary sprig. Skewer several fresh cranberries onto a sprig of rosemary. Pour Wild Turkey Bourbon over ice in a rocks glass.